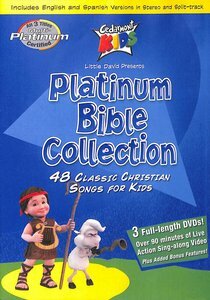 Welcome to the very special Platinum Bible Collection from Cedarmont Kids. All the well-loved songs from the individual DVDs Bible Songs, Action Bible Songs, and Sunday School Songs are all together in one collection. In this live action sing-along set, you'll get 48 back-to-back music videos for kids, over 90 minutes, on 3 full-length DVDs. Recommended for ages 2 to 5. About "Platinum Bible Collection DVD (Kids Classics Series)"
:Welcome to the very special Platinum Bible Collection from Cedarmont Kids. All the well-loved songs from the individual DVDs Bible Songs, Action Bible Songs, and Sunday School Songs are all together in one collection. In this live action sing-along set, you'll get 48 back-to-back music videos for kids, over 90 minutes, on 3 full-length DVDs. Recommended for ages 2 to 5. Times have changed, but some things are still the same: kids love to sing, play and have fun! Even in today's world, kids are still kids, sharing the same special joys of childhood that parents remember from 20 (or more) years ago. Cedarmont believes that music is one of those special joys. And in music, the best songs never go out of style. Remember all those songs you learned as a child? Chances are those songs can be found on CDs and DVDs from Cedarmont Kids. Kids learn by seeing and doing. Cedarmont have kept that in mind with theirproducts. On Cedarmont DVDs, they'll see real kids doing things they all like to do. Also, most of their CDs and DVDs include lyrics and split-tracks so that kids can sing along. Many of their CDs include coloring and activity pages that you can print on your computer! Most of all, kids love the music. Whether it's the fun, traditional sound of the Cedarmont Classics series or the upbeat Gospel and Worship titles, your kids will enjoy singing along with the Cedarmont Kids. And, if you have a new addition at your house, you'll enjoy sharing the instrumental sounds of the Cedarmont Baby series. Over 30 minutes of lively sing-along music and fun actions that will teach your 1-8 year olds godly principles for life. Includes the popular action songs, 'Father Abraham ', 'This Little Light of Mine ', and 'I 'm in the Lord 's Army '. 16 back to back music videos just for kids! Includes the well-known Christian songs, 'Joshua Fought the Battle of Jericho ', 'My God is so Big ' and 'I Have Decided to Follow Jesus. ' Help your kids to learn biblical truths in a fun and memorable way! Super value for three of the most popular titles in the Cedarmont Kids CD collection! BIBLE SONGS, ACTION BIBLE SONGS and SUNDAY SCHOOL SONGS come together for the first time in this fantastic boxed set. A great gift that provides a comprehensive selection of classic children's worship music. This joy-filled series will entertain your 1-8 year-olds for hours with fun songs to sing-along with and learn. There are Sunday School songs, praise songs, and just plain silly songs! Each volume includes split-tracks - for performances without the recorded vocal. 15 to 26 songs on each recording. 0 Available. Expected to ship within 2 days from Australia.